To bright white sands on distant shores! Ride quietly at anchor in a distant cove which is all yours for the day! For those who can successfully “throw out the hook” their boating experience is rich with alternatives and options that the dock-bound boater can never duplicate. This Tech Talk will discuss anchors and anchoring systems – their advantages and limitations. Learn where and how to place your anchor and, importantly, how to retrieve it. 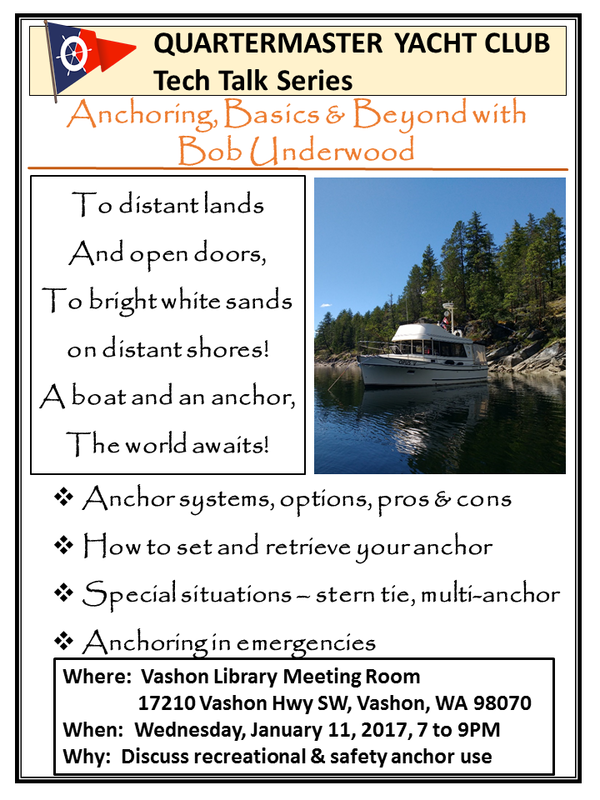 We will discuss unique situations like stern tie, steep-to and multiple anchor scenarios. And no Tech Talk is complete without discussing the safety aspects of your anchor. Bring your questions and experience to this important Tech Talk hosted by Kevin Jones and Bob Underwood on Wednesday, January 11 at 7PM in the Vashon Library meeting room.